I woke up early this morning to the sound of a surprise thunderstorm rolling in. I delayed my departure for a while, leaving around 8am. The first 30 miles were on a dirt trail, and it was still raining, though the thunder had abated. My rain great performed admirably, but I still got lots of dirt in me and my bike. I also had my hardest down tree yet, I had to carry my bike sideways under a tree trunk. Once I got off the trail, I took 30 minutes to clean of my bike and dry my raincoat (the rain had passed by then). The next sixty miles were easy by comparison. Paved roads with generous shoulders, a slight tailwind, and cool, sunny weather. I crossed the Mississippi at Nelson/Wabasha, and continued on to my hosts Martha, Brad, Emily, and Willa, who live on a farm just west of frontenac. There was a really good climb up a dirt road to get to their house, which was actually pretty fun after the flat (but fast!) terrain along the river. The picture is from reeds landing. 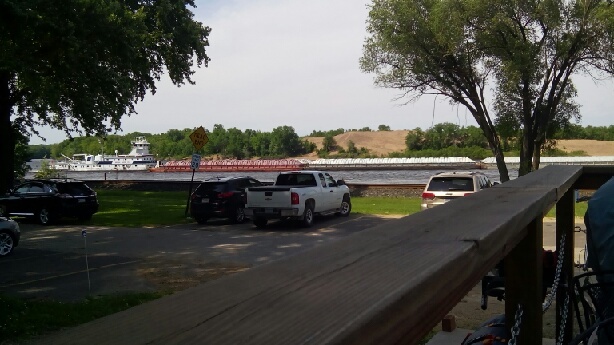 I saw a barge going up the river, a pretty cool sight. Now I'm all caught up on my posts, whew. Looks like your back at it. Good luck with your westward journey. We're all rooting for you.